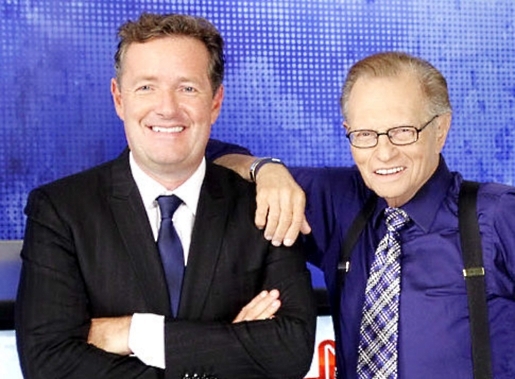 Former CNN headliner Larry King sat down with BBC radio yesterday and chatted about a number of topics, but most notably shared his opinions on how his 9pm replacement Piers Morgan is doing in his former spot. King told his interview that Morgan was oversold to a CNN audience, saying “One of the problems they did was oversell it,” King said. “He was going to be dangerous, he’s going to be water-cooler talk…he’s good! he’s not that dangerous.” And that may have been the nicest part. Former long-running CNN talk show host Larry King has claimed his successor Piers Morgan, was “oversold” to US television audiences. “I don’t want to be horrible about him, I think he’s a fine broadcaster,” King told BBC Radio 4’s PM programme. After it was announced that the former newspaper editor would be replacing King last year, a huge advertising campaign began to publicise the show. “I think they might have been better off starting quietly,” King said. King bowed out in December after presenting his CNN talk show for 25 years. Morgan made his debut in January with Oprah Winfrey as his first guest. Critics gave a mixed reaction to Morgan’s first show with the Philadelphia Inquirer newspaper calling him “enthusiastic and effusive”. King ended his interview with the sort of faint praise that comes from someone who might be exhibiting a bit of schadenfreude over Morgan’s tepid ratings, saying “I like him,” before adding “he’s certainly not bad.” Huh. Listen to the entire interview at BBC.